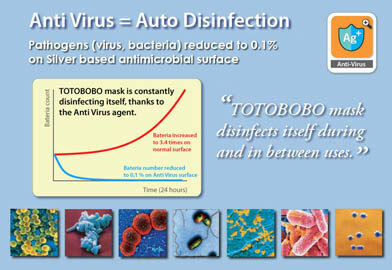 Totobobo® mask contains BioCote®, a silver-based antimicrobial agent. The silver ion ingredient provides continuous anti­microbial properties throughout the lifetime of the product. BioCote® effectively inhibits the function, growth and reproduction of a wide range of micro-organisms. Silver ion based antimicrobial additives have been proven to work throughout history. It is not toxic, flammable nor corrosive and will not cause bacteria to become resistant to antibiotics. BioCote® active ingredients are registered with the US Environmental Protection Agency (EPA). 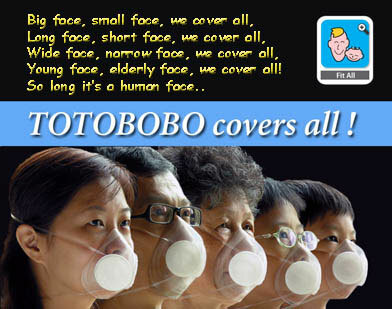 The patented Tototobob mask is the world first customizable mask designed to fit all face shapes (face length 85mm~135mm). A quick Visual Seal Check (VSC) is all you need to ensure good face seal. It’s much more intuitive and 100 times quicker than typical fit-test. We validated the VSC with the golden standard fit-test- TSI PortaCount Plus quantitative fit test system, so you don’t have to do it again. Your time can be saved for more important tasks. Normally, you have to dispose of the whole disposable respirator after use, including the rubber band and the metal nose clip. With TOTOBOBO, the only thing you need to dispose of is the used filter. It is a lot more eco-friendly, consider the millions of disposable respirators dump into the landfill every day. Reuse is safe, easy and does not require special equipment for disinfection. Just wash the mask with soap and rinse it with water and dry. Pop in a new filter and snap the filter cover back on and the mask is ready to be used again. High Efficient Filter combines high filtration efficiency (protection) with high flow rate(ease of breathing). It makes breathing through the mask very easy and yet provides high level of protection. The secret of this highly desirable characteristics lays in the 3D structure of the filter media, which is much thicker than other disposable respirators. The filter media is charged with static electricity, arresting the finest particles before they have a chance to penetrate the media. 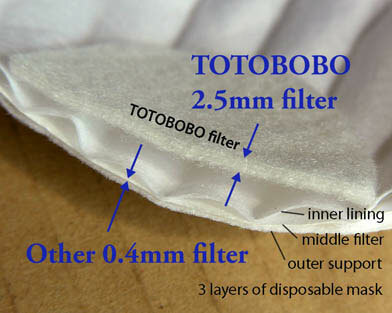 The filtration efficiency of Totobobo filter (F94) is 94%. This means it is able to filter out at least 94% of the most penetrating particles size of 0.1 micron. This filter is able to block very small (often invisible) particles and aerosols from combustion sources such as motor vehicle exhaust, industrial processes, cigarette and incense smoke, cooking, and woodburning activities; biological components such as pollen and mold spores, and dust mite and cockroach allergens; fine fibers such as asbestos; and soil particles. However, it is not suitable for gases such as Ozone or carbon monoxide. 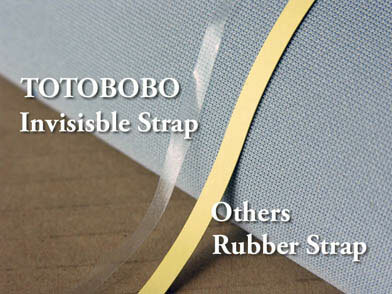 It is difficult to get a clear picture of the Invisible Strap used to hold TOTOBOBO mask. – It is much more enduring than rubber (3 times) and proven resistance to perspiration, urine, oil, water, sea water, Lt. acid cosmetics, general solvent.. etc. It can be washed by hand and machine or dry cleaned. The transparent elastomer (TotoSoft) developed specially for TOTOBOBO is soft and comfortable to wear. Easy to trim and easily adapted to different face shape. Thin and follow the nose bridge snuggly, it does not require a nose clip yet fitting much better than most other respirator thanks to the ergonomically design profile. Almost like a second skin, it does not cause any interference or fogging when wearing glasses. Heat come out of the thin and transparent mask much faster than other disposable respirators, keeping your face cooler. The inside rim is finely textured, making it easier to detect face seal with presence of moisture. Three stepping contour lines for easy trimming to fit smaller faces. The two openings fit snuggly with the filter cartridges ensuring an air-tight assembly. Spring open design for easy donning. Finally, the mask body can be folded flat and easily kept in a shirt pocket. All ingredient goes into the material formula are approved by FDA (USA). TOTOBOBO can drastically simplify your logistic burden for keeping track of multiple brands/sizes of masks in order to fit different people within your organization. 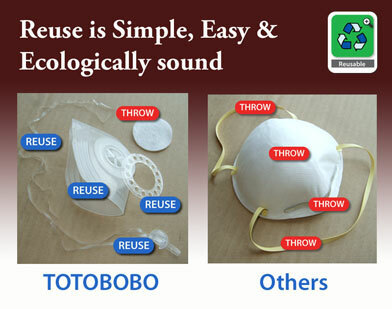 Because the mask is reusable, it is only necessary to keep a small number of TOTOBOBO for occasional replacement. 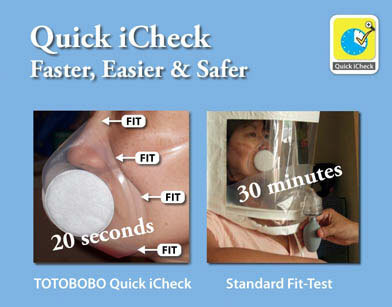 TOTOBOBO filter takes up less than 1/12 of the space of a foldable disposable mask. It cost less than half of a typical disposable solution and yet provide improved protection for all your staffs. How much does the 96% mask cost? How much do the filters cost? Are there any places in Canada that I can buy one? Are Totobobo filters replacement filters readily available? Thanks I’m available by email. I have promoted your product from the begging when they were very inexpensive to buy;. I did not buy one, but knew it was a great product for the bicycle riders and others. I still do tell people about them. I didn’t get one but don’t worry if its helpful for people I tell them. Hi.. I tried to purchase it, but seem like no stocks. of spam remarks? If so how do you protect against it, any plugin or anything you can suggest? I get so much lately it’s driving me crazy so any help is very much appreciated. Many thanks! What’s the difference between Matrix and other filters? Please, I have interes in commercial and technical information about your product. Please step for commercial operation. I just purchased one of your masks and love it, but, just for aesthetic reasons, I was wondering if the mask can be coloured black at all? Is there a paint or other substance that I could use that could safely and effectively improve its general appearance? Are you going to create certified filters, certified to n95 level? Pingback: Happy 47th Birthday to Singapore! Are the straps interchangeable? So if I buy a mask with a head strap and also buy additional ear loop straps, will they work together if I decide I prefer ear loops over the head strap? I live in the Great Britain, do you have any outlets or re sellers here ? I cycle to work sometimes under heavy traffic conditions and use a repso mask which has filters to protect against these pollutants. Look forward hearing from you. Is there also a filter for Carbon monoxide as its my biggest concern with riding my bike in heavy traffic? We have the Matrix filter which absorb smells and organic vapors as well as cutting down very fine particles including 0.3 microns. In addition to filtering smells, what is the filter efficiency of the matrix filter for particles? 96, 94, or 92%? When one buys a mask, does the mask come with some filters? What kind? The mask come with a pair of filter pre-installed so you can use it right away. I have a question. Would this mask protect from paint particles in the air for when I am airbrushing? I am a hairstylist, would the masks block the chemicals I breath in from hair color? I want to purchase two masks and the 96% filters. How do I do this as I do not want the 94% filters. I’m in KL, Malaysia, do you have any outlets or reseller here? Hi Steve, we don’t have an outlet in K.L. yet. Additionally how useful would it be for fire or smoke escape purposes? Many thanks! Zaid, the filters can be kept in storage for 2 years in sealed plastic. The filter is able to block smokes particles, but the fire temperature may cause the mask to soften or melt. So it is not recommended for fire escape purpose. Hi – how long can the filters be kept in storage? Is there an expiration date of can it be kept indefinitely till usage? Hi Kim, how long you need to change the filter depends on your application. For example, if you use the mask to reduce traffic pollution or other irritants like pollen, you may wait until the filter turns from white to grey. However, if you want to get respiratory protection from flu or other airborne virus then you may want to change the filter more frquently. In hospital setting, they follow a clear protroco. One may need to change the filter every 4 hours or everytime he/she went into an ICU. In any case, you should not keep using the same filter for over 4 weeks. 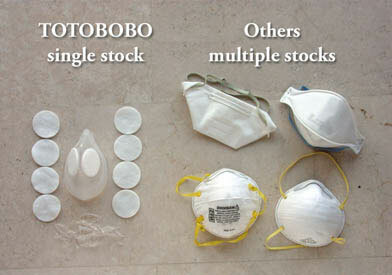 How often do you need to change the filters in the TOTOBOBO masks? Is this mask suitable for the new Swin Flu going around? Please let me know. Hi Rob, any mask that form a tight seal on your face and installed with effective filter should be able to reduce the chances of air borne virus. N95 mask, if it seal your face will reduce the chances by 95%. 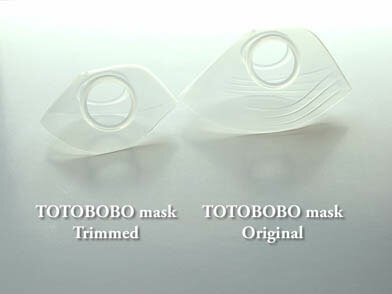 Totobobo mask, if it seal your face, will reduce the chances by 94%. Hi Paula, the mask/ strap does not contain any latex material. Pingback: TOTOBOBO mask » Blog Archive » What are cyclists looking for in a pollution mask?